The Lassco Wizer floor standing paper drill comes in two different models. The FM-2 Single Spindle Paper Drill and the FMP-2 Single Spindle Drill are both economical heavy duty floor standing paper drills. These machines are designed to drill one hole at a time while offering a hands-free, low maintenance, and efficient operation. 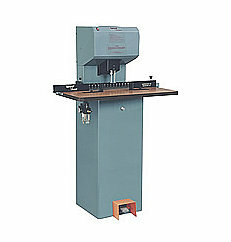 The FM-2 single spindle paper drill is the lowest cost floor model paper drill on the market. This economical heavy duty floor standing paper drill is designed to drill one hole at time in a stack of paper up to 2 inches thick. This paper drill is an excellent choice for organizations that need to drill custom hole patterns by offering incredible flexibility and ease of use. The FM-2 features a manual foot petal operation that gives you full control over the drilling speed of the unit and giving the user a hands free operation. The mechanical lift table traverses right and left for multi-hole drilling in a short amount of time. The FM-2 Single Spindle Paper Drills has been improved with the EZ-Glide table system allowing quick movement from hole to hole for multi-hole drilling. The FM-2 includes four interchangeable hole patterns, with custom patterns available. A release lever is positioned on each side of the table to provide either left or right handed operation. This machine will provide maximum production at an affordable cost. The FMP-2 Single Spindle Drill offers all of the same great features of the FM-2, with the addition of being fully electric. With the added convenience of a foot petal, this machine is activated by a pneumatic power table. The FMP-2 can drill through hundreds of sheets of paper at once with a 2 inch drilling capacity. This machine features a mechanical lift table that has a right to left and left to right traversing feature for multi hole punching. The FMP-2 has been improved with the EZ-Glide table system allowing quick movement from hole to hole for multi-hole drilling. 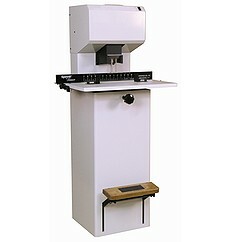 This machine includes four interchangeable hole patterns, with custom patterns available. A release lever is positioned on each side of the table to provide either left or right handed operation. An accessory package is included with both the FM-2 and the FMP-2 which includes: a drill sharpener, Spin-Eze drill bit lubricant, 5/16” drill bits, and a chip clearer. Both machines are great buys. If you have any questions or are interested in the FM-2 and FMP-2 Single Spindle Paper Drills, visit us at SpiralBinding.com. We have great pricing on a full line of Floor Standing Drills. Call us at 1-800-631-3572 for more information!